Cookery competition. It's the last of the semi-finals. The first task for the remaining celebrities is to create one exceptional dish inspired by someone or something they love. It's the last of the semi-finals, and the remaining celebrity cooks continue to battle for the MasterChef title. Their first task is to create one exceptional dish inspired by someone or something they love. The celebrities must impress John and Gregg by showing that they can put passion into their dishes and have the heart and determination to remain in the competition. The greatest cooks in the world are able to show emotion through their food - will our remaining cooks be able to do the same? 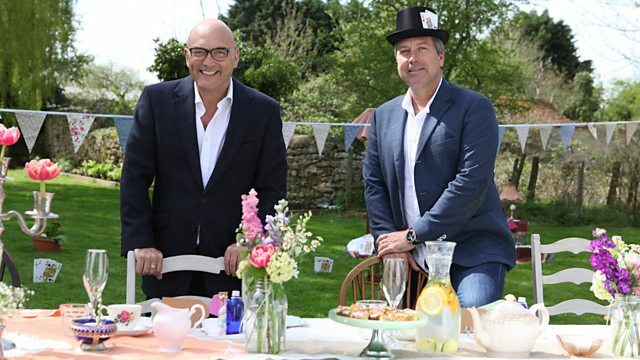 Next, the remaining five celebrities face their most daunting challenge yet - preparing an afternoon tea for a Mad Hatter's tea party to celebrate the 150th anniversary of Alice in Wonderland. However, they won't be cooking their own dishes. They will be cooking with one of the country's most creative and exciting development chefs - James 'Jocky' Petrie. Under his guidance and following a recipe, they will each have to recreate one of his dishes, but to succeed they will have to master ideas and techniques they could never have imagined. Finally, it's back to the MasterChef kitchen, where the final five will have to show what they have learnt in a pudding invention test. Each contestant will have one hour and fifteen minutes to create an exceptional pudding dish to keep them in the competition. For the cook who doesn't make the grade, their competition will be over. The remaining four will go through to the final week, taking a step closer to being crowned 2015's Celebrity MasterChef champion.